Who doesn’t love the taste experience of eating silken chocolate and a crisp cookie or puffed cereal? Chocolatiers incorporate feuillantine (finely crumbled wafer cookies), puffed cereal, toasted nuts and seeds to add texture to their bonbons. Using quality couverture chocolate, you can make these Crispy Chocolate, Fruit and Ginger Rochers at home. They are a pretty good facsimile of a candy popular with professionals. Rocher means rock in French. These rocher candies look like craggy pieces from deep within a mine. Find couverture chocolate at a specialty store or online as I do. The term couverture refers to chocolate blended with enough cocoa butter to give it a silken mouth feel. It does require tempering, that careful process of melting and stirring that gives the finished candy the right bite. And prevents the chocolate from developing white streaks called bloom. But if you use chocolate directly from its packaging and melt it slowly at a low temperature, you can keep it in temper and save yourself some fuss. The combination of things to add to the chocolate is endless. A crunchy element and other goodies. I’ve used puffed brown rice (too soggy), Biscoff cookie crumbs (yummy like gingerbread), puffed quinoa (delightful but hard to find) or corn flakes. Rice Krispies are reliable good with an audible crunch just like the commercial. Then the fruity element. Just about any dried fruit works. Apricots, currants, pineapple or cranberries are great. Candied orange or grapefruit rind too. And freeze-dried raspberries add a real kick. Something nutty comes next for a different texture and taste. Be sure to lightly toast the nuts first. 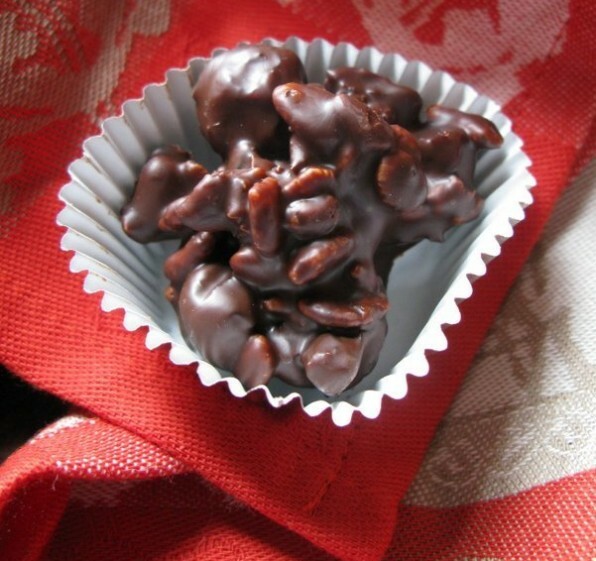 Slivered almonds are classic in rochers. Walnuts and pecans make it more of an American candy. You can also season the chocolate with ground cinnamon or a grating of black pepper or a few drops of lemon oil. Just don’t add any liquid or the chocolate will seize into a grainy mess. If you want to make your own flavor profile, I suggest you scribble down things that appeal to you. Then use one crunchy, one nut and one or two fruit elements. And see how that goes. You could use a silicone mat when making these candies but the chocolate may pool around the bottom. Instead use Chocolatier Donald Wressell’s trick. Stretch plastic wrap tightly across the top of a baking sheet. This forms what looks like a plastic trampoline. Each rocher sits in its little spot and seems to cluster nicely. Sunday December 21, 2015, the Chester Sunday Market in Connecticut celebrates all thing chocolate. I’ll be making these and other chocolates treats at the Lori Warner Studio/Gallery from 11 – 2PM. Come join us. You could use a silicone mat when making these candies but the chocolate may pool around the bottom of each bonbon. Instead use Chocolatier Donald Wressell’s trick. Stretch plastic wrap tightly across the top of a baking sheet. This forms what looks like a plastic trampoline. Each rocher sits in its little spot and seems to cluster nicely. Stretch plastic wrap over a half-size sheet tray or cookie sheet so that the plastic is suspended over the tray like a trampoline. Place the chocolate and coconut oil in a bowl sitting over barely simmering water. Stir from time to time until the chocolate melts. Remove the chocolate from the heat. Using a rubber spatula, fold in the puffed rice, cherries, cashews and candied ginger. Mix until all of the ingredients are completely coated with chocolate. If the mixture seems loose and chocolate pools at the bottom of the bowl, add another few tablespoons of puffed rice and additional dried fruit until the chocolate is absorbed. Scoop up a small amount of the mixture with a teaspoon. Using a second teaspoon, scrape out the chocolate mixture into a mound onto the plastic wrap-covered sheet tray. Drop teaspoons of the mixture in uniform mounds spaced about an inch apart. Let the rochers set up in a cool place preferably not in the refrigerator. Once the chocolates are firm, usually in about an hour, peel them from the plastic and store them in an airtight container in a dark place. Serve these within a week of making them.